Sieve Analysis of Soil; Its Determination, Theory, Precautions. Sieve analysis of soil is a simple operation of dividing a sample of aggregate into fractions, each consisting of particles of the same size. Sieve Analysis of Soil Test. Q & A about Sieve Analysis of Soil. In practice, each fraction contains particles between definite limits, these being the openings of standard test sieves. Before sieving, the soil should be air dried in order to avoid lumps of fine particles and also to prevent clogging of the finer sieves. Sieves should also be cleaned before use. The actual sieving operation can be done by hand or as in modern laboratories by a sieve shaker. Grading curves with the ordinates representing cumulative percentage passing and the abscissa the sieve opening to logarithmic scale can be drawn to study the results of sieve analysis of soil. By using these curves, it is possible to see whether the grading of a given sample conforms to that specified or is too course or too fine, or deficient in a particular size. A sieve consists of a metal ring, usually made of brass, whose dimensions are typically 2 inches Deep and 8 inches Diameter (Also available in 12 inches and 18 inches diameters), with a wire mesh or screen on the bottom. For example, the U.S. Bureau of Standards No.4 sieve has four 0.187 inch openings per inch. (The reason the openings in a No.4 Sieve are not 1/4 inch in size is that the 1-inch linear measurement also includes the diameter of the standards (thread) that comprise the mesh). The stack sieves are called a nest of sieves. The nest is arranged with the largest screen openings (smallest sieve number) on top, progressing to the sieve with the smallest screen openings (largest sieve number on the bottom of the nest). A lid is placed on top of the nest, and a pan is placed below the bottom sieve to catch any soil that passes through the smallest openings. Care should be exercised when removing a sieve from the nest. Often the sieves fit tightly, and a sudden, unexpected dis-engagement could result in the contents being spilled from the sieve. Additionally, a principally horizontal shaking motion should be used instead of mostly a vertical motion. This motion has been found to be more efficient, and it also results in less loss during the test procedure. Read Also: Field Density Test of Soil by Sand Replacement Method. A 10-minute shaking period is suggested in Sieve analysis of soil procedure. A large quantity sample required longer shaking than a smaller sample. Similarly, a sample comprising primarily of fine-grained material will require a longer shaking period than a coarse-grained sample of equal weight. Nodules of lumps of soil must be broken down into their individual particles in order for the grain size analysis to be valid. This is accomplished in two ways. The first is to break up the lumps with a rubber-tipped pestle in a ceramic mortar. It has been found that rubber-tipped pestles will not grind or crush the individual particles while a ceramic or metal-tipped pestle will. The second is to “wet sieve” the soil. Washing the particles that are retained on the No. 200 sieve with water accomplished two things. 1. It separates those small lumps that might not have been broken up with the rubber-tipped pestle into the individual particles. 2. It washes the “Dust sized” particles of the larger particles end through the No. 200 sieve. Particles that appear to be stuck in the sieve screen should never be forced on through the mesh. 1. The particles would have passed through the screen on their own, had they been smaller than the mesh opening. Forcing these particles through the screen to be retained on the next size would distort the again size results. 2. Secondly forcing the particles through the mesh can damage the screen and necessitate its replacement. Particles caught in a screen should be removed by brushing with the proper sieve brush wire. Brushing should be done from the underside of the screen in order that the particles can be brushed out of screen in the direction from which it entered the screen opening. Stubborn particles that cannot be removed by brushing should be left in place rather than forced out. The number or sizes of sieves used in the nest depends on the type of soil and the distribution of the particle sizes. (Generally sieve No.4, 10, 40, 100, 200) are used for classifying the soil. Fineness modulus is a single factor computed from the sieve analysis and is defined as the sum of the cumulative percentages retained on the sieve of the standard series divided by 100. The fineness modulus can be looked upon as a weighted average size or a sieve on which the material is retained, and the sieves being counted from the finest. Thus a fineness modulus of 6.00 can be interpreted to mean that the sixth sieve, 4.75 mm is the average size. The fineness modulus cannot represent the particle size distribution, but it is useful for measuring slight variations in the aggregate from the same source, i.e., as a day to day check. Based on the practical experience, the fineness modulus of fine aggregate should be between 2 to 3.5 and of coarse aggregate between 3.5 to 8. 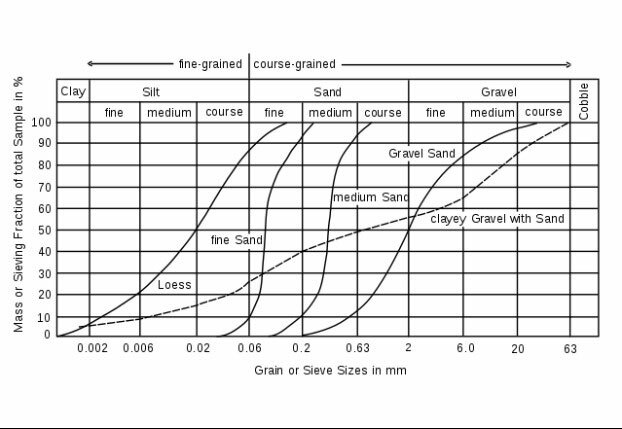 Usually, the Fineness modulus is calculated for fine aggregate rather than for coarse aggregate. 2. Mortar and pestle or a mechanical soil pulverizer. 3. Balance sensitive to 0.1 gm. 1. Obtain the soil sample which has already been pulverized or washed by placing it on sieve No. 200 and then dry it in an oven. 2. Arrange a nest of sieves including sieves No.4, 10, 16, 30, 40, 50, 100, 200 and Pan. 3. Place the stack of sieves in the mechanical sieves shaker and sieve for 5 to 10 minutes. Note that if the entire stack of sieves does not fit into the shaker, perform a hand shaking operation until the top few sieves can be removed from the stack and then place the remained of the stack in the mechanical shaker. 4. Remove the nest of sieves from the shaker and obtain the weight of material retained on each sieve. Sum these weights and compare with the actual weight taken. A loss of more than 2 percent by weight of the residual weight is considered unsatisfactory, and the test should be repeated. 5. Compute the percent retained on each sieve by dividing the weight retained on each sieve by the original sample weight. 6. Compute the percent passing (or percent finer) by starting with 100 percent and subtracting the cumulative percent retained for that sieve. Watch the Video below for clear understanding. Weight of sample used in this Sieve analysis of soil is 1000 gm. 1. Weight retained in percent = [Weight of soil retained (gm)/Total weight of sample]x100. 2. Cumulative percent retained = Weight retained in % + Previous line of Cumulative percent retained. 3. Percent passing = 100 – Cumulative percent retained. 1. Loose clots may be broken with hands or rubber tipped pestle. 2. The whole set of sieves should be shaken in each direction. 3. Weigh the retained soil on each sieve carefully. 4. Soil should be oven dried at 100 +- 5°C for 24 hours before sieve analysis. Q.1: What is meant by the nest of sieves? Ans: The stack sieves are called a nest of sieves. Q.2: What is meant by the size of a sieve or number of the sieve? Ans: Sieve number or size means the number of openings per linear inch in a sieve. Q.3: How much shaking period is recommended for sieve analysis of soil? Ans: 10 minutes of shaking is recommended. Thanks for reading this article. Don’t forget to share it. Read Also: Quarrying of Stones: Its Methods, Selection of Site, Preparation Steps.